Today I heard some interesting comments during a conversation with a couple of students. These comments were unexpected in the way that I wasn't expecting to hear them at that time, but not unexpected in the sentiment that was shared. You see, I was talking to a couple of my 7th graders about the books they're reading right now and we got to talking about what all they've read this school year. And both of them shared that they've read more already this year (two months in) than any other year in school (one even admitted that perhaps more than she's read ever). I always smile when I hear this because I love when students come to this realization themselves. I told them how great that is. And then they kept talking. They shared thoughts that they didn't like reading as much last year because the teacher chose what they read instead of the students choosing themselves. They shared that they liked reading this year because there are so many books in my classroom to choose from...and they're good books. They shared that they find they're reading more because they have to read during class time, and then the books they're reading are so good that they want to find out what happens next, so they read at home. They shared that they were already figuring out what books they don't like reading and the ones they do. They shared that they're sharing books with each other - making the other one read ones they really like. They shared that they hope they can read even more next year. They shared that they're scared or not looking forward to high school and what they might have to read. They shared that they're readers this year. None of this was prompted. This was an unplanned conversation. It was not a formal formative assessment opportunity, but oh so much was learned. I learned that these two students are making determinations about genre and what books fit their interests. I learned that they are able to identify what they do and don't like in books they read. I learned that they know how to navigate the classroom library to find what they want. I learned that they are finding ways to make a reading habit at home. I learned that they are engaging with their books and carrying that over outside of school. I learned that they are paying attention to what we talk about in class and applying it to their books. I learned that they are sharing with each other what they're reading and building their own community for book recommendations. I learned that they see themselves as readers as they never have before. I learned that if we take the time to listen, our kids will tell us what they know, want, and need as readers. What was my takeaway? 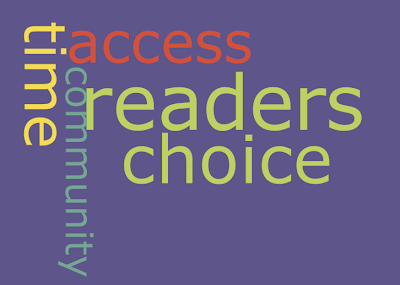 With time, choice, access, and community, students will be readers. Something I will always think about at the start of a year (and throughout) Am I giving time to read, allowing choice in what is read, providing access to reading material, and creating a supportive reading community?